Digital Textile Printing Equipment Market Key Players: Roland DGA Corporation, Seiko Epson Corporation, DCC Print Vision LLP, MIMAKI ENGINEERING CO.,LTD, Kornit Digital Ltd, Konica Minolota, Mutoh Holding, Dover Corporation, Shenzhen HOMER Textile Tech Co., Ltd., SPGPrints B.V., and Electronics for Imaging (EFI), Inc. This PMR study offers a detailed ten-year analysis and opportunity assessment for the global digital textile printing equipment market for the period between 2018 and 2028. For this study, we have considered 2017 as the base year while market numbers have been estimated for 2018 and projections have been made for the period 2018 to 2028. The CAGR (Compound Average Growth Rate), in terms of both volume & value, has been represented from 2018 to 2028. In this study on the digital textile printing equipment market, various perspectives such as market dynamics, competition analysis, pricing and value chain analysis, regional & segmental growth, macro-economic & industry growth analysis, emerging country growth analysis and segment-level projections have been discussed in a comprehensive manner. After a detailed study of the global digital textile printing equipment market and analysis of the perspectives of industry participants, it has been concluded that the global digital textile printing equipment market is expected to grow at a value CAGR of 14.9% during the forecast period. The future outlook of the digital textile printing equipment market is expected to remain lucrative, owing to the healthy growth of the textile industry of various regions. The textile industry is a prominent industry in terms of historical growth outlook and is further expected to grow with a similar pattern during the forecast period. Moreover, Europe is expected to be a prominent region in the global digital textile printing market in terms of revenue in 2018. The East Asia digital textile printing market is pegged to be relatively attractive with a CAGR of 20.3% during the forecast period. This report on the digital textile printing equipment market analyses the market at a regional and global level through various segments on the basis of key parameters such as printing type, consumable ink, application, fabric, sales channel and region. 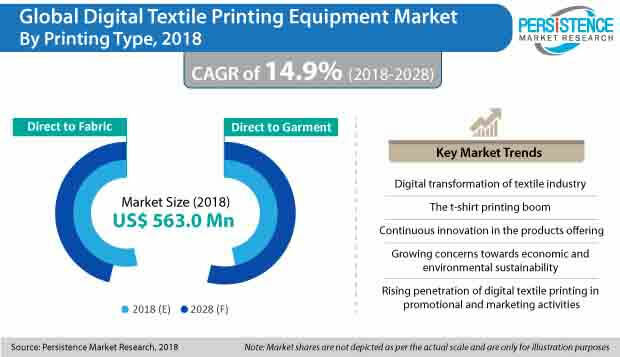 The main objective of this report is to provide key insights regarding ongoing trends, competition positioning, growth rate, market potential and other such relevant information & statistics in an appropriate manner to the buyers or various stakeholders in the global digital textile printing equipment market. In this report on the global digital textile printing equipment market, all the sections have been structured in a systematic way to allow the readers to develop a detailed understanding of the global digital textile printing equipment market. This report on the digital textile printing equipment market begins with the executive summary of the report, which is followed by market introduction, market dynamics, market background and market analysis by key segments at a global level. Further, regional analysis and competition landscape have also been included under the scope of the report. Each section covers qualitative and quantitative assessment of the digital textile printing equipment market on the basis of current developments, historical developments, trends and key opinions gathered through primary interviews with industry participants. The digital textile printing equipment market report begins with the executive summary, in which a detailed overview of the whole market has been presented. In the next section, the report provides a market introduction and market definitions along with taxonomy. In the next section of the report, important market background information, such as macro-economic & forecast factors, industry factors, pricing analysis, value chain and a detailed assessment of the sales of digital textile printing equipment for the base year, has been considered for the study. In the next section, market dynamics such as drivers, restraints and trends have been studied and their impact on the overall market at a global level has been discussed in detail. Additionally, opportunities for digital textile printing equipment manufacturers have also been analysed in the subsequent section. In the following sections of the report on the digital textile printing equipment market, market volume (Units) and value (US$ Mn) projections for the aforementioned segments, followed by the summarised view of the seven prominent regions at a global level, have been included for the digital textile printing equipment market. In order to provide an accurate forecast, we started by calculating the current market size, which provides us a basis of how the market for digital textile printing equipment is expected to grow in the future. To get a better understanding of the characteristics of the digital textile printing equipment market, we triangulated the outcomes of three different types of analysis: primary, secondary and FMI analysis. As previously stated, the global digital textile printing equipment market has been split into six segments. These segments, on the basis of printing type, consumable ink, application, fabric, sales channel and region, have been analysed on the basis of BPS (Basis Point Share) to understand the relative contribution of the individual segments to the growth of the overall digital textile printing equipment market. This information is important for the identification of various trends in the global digital textile printing equipment market. In the last section of the digital textile printing equipment market report, a competition landscape of the digital textile printing equipment market has been included to provide a dashboard view to the report audiences, categorised on the basis of players present in the value chain, their global presence in the digital textile printing equipment market and other differentiating factors and strategies. The primary providers covered under the scope are the producers or manufacturers of digital textile printing equipment. In addition to this, the section is mainly designed to provide a detailed comparative assessment of the key manufacturers of digital textile printing equipment and their place in the value chain of the digital textile printing equipment market. In our study, we have also included detailed company profiles of players involved in the manufacturing of digital textile printing equipment to evaluate their long- & short-term strategies, recent developments and key offerings. Some of the key players covered in the digital textile printing equipment market report include Roland DGA Corporation, Seiko Epson Corporation, DCC Print Vision LLP, MIMAKI ENGINEERING CO.,LTD, Kornit Digital Ltd, Konica Minolota, Mutoh Holding, Dover Corporation, Shenzhen HOMER Textile Tech Co., Ltd., SPGPrints B.V., and Electronics for Imaging (EFI), Inc., among others. The report covers detailed information about market dynamics, value (US$ Mn) and volume (Units) historical and future projections, competition landscape and key developments regarding the digital textile printing equipment market for the forecast period 2018 to 2028. The global market of digital textile printing equipment is expected to attain a value of US$ 2,255.4 Mn by the end of the forecast period, growing at a CAGR of 14.9% between 2018 and 2028. The growing penetration of digital textile printing equipment in the textile industry, owing to enhanced quality of printing offered by digital technology, is expected to drive the market during the forecast period. In the utilization of digital textile printing equipment process, a small amount of water is consumed when compared with screen printing. Around 50-60 liters of waters is consumed for one meter of cloth in screen printing while, in digital textile printing, water consumption is reduced by to 10 liters per meter, which can be attributed to the elimination of washing off of screens and fixing. Moreover, wastage of color or ink is also reduced with the usage of digital textile printing equipment. Electricity consumption can be reduced by 60% with the use of digital textile printers as compared to screen printers. End-use industries such as food & beverage, pharmaceutical, personal care and automotive, among others are adopting digital textile printing equipment for the printing of promotional products such as point of purchase banners and displays. Rising competition in the market has led to the growth of promotional activities across the globe. Moreover, advertisements have becomes more expensive and, at the same time, less effective in enhancing sales as consumers have lost interest in advertising content on audio & video media. Furthermore, promotional activities have been creating an immediate positive impact on sales of digital textile printing equipment and can drive impulse buying. Digital textile printing equipment are generally preferred for the manufacturing and printing of sales promotional products such as banners & displays. Additionally, when paralleled with digital flexographic printing, which is commonly used for the printing of promotion banners, digital textile printing equipment provides high-quality images with good clarity, glossy & eye-catching graphic. Various shades and color combinations can be attained through digital textile printing equipment. Therefore, growth of promotional and marketing activities in the market for the enhancement of the overall sales of target products is anticipated to drive the demand for digital textile printing equipment during the forecast period. The initial cost of installation of digital textile printing equipment is high, as the cost of digital textile printing equipment and the ink used in them is higher as compared to the traditional printers. In certain countries, the stamp printing method is still popular. The price of analog printers and their accessories is low as compared to digital printers, which contributes to the utilization of analog printers in price-sensitive regions. Therefore, the high price of digital textile printing equipment may have a significant impact on the overall sales and market of digital textile printing equipment around the globe. From the world of high fashion and fast fashion clothing to sportswear, from accessories to furnishings, the boom in digital printing on textile has contributed to transforming the dynamics underlying these sectors in terms of productivity, creativity and application. Digital textile printing equipment technology opens the door to creativity by encouraging photographic reproduction, the creation of more complex designs and experimentation with brand-new applications. Expansion of the printed T-shirt sector is directly tied to the evolution of direct to garment (DTG) technology. This phenomenon has grown rapidly, owing to its ability to satisfy demand from mass market for original and personalized items. Key manufacturers in the global digital textile printing equipment market are involved in the manufacturing of customer-specific digital textile printing equipment and the introduction of new products in order to provide continuous support in the fast growing area of textile decoration. Digital textile printing equipment and its technologies are rapidly improving and increasing, and changing the face of the textile printing industry. For instance, in January 2018, Epson announced its high performance SureColor F2100 direct-to-garment printer. This new printer offers enhanced performance, increased reliability, and print quality to printing shops producing custom garments. It is equipped with precision core printhead and ultrachrome garment ink technologies. The digital textile printing equipment market is consolidated and mainly dominated by Tier 1 players of the market. How has the digital textile printing equipment market evolved in the past few years? How is the digital textile printing equipment market expected to grow, both in terms of value and volume, during the forecast period? What are the key market dynamics in the global digital textile printing equipment market? What are the important developments in the global digital textile printing equipment market? How are the macro-economic factors impacting the overall growth of the digital textile printing equipment market? What are the key opportunities and challenges for digital textile printing equipment market players? What are the market positioning and key strategies of manufacturers as per the digital textile printing equipment market taxonomy? How is the competition structured in the digital textile printing equipment market at present and how has it evolved over the past few years?